Joe Quick earned his PhD from the Department of Anthropology at the University of Wisconsin-Madison. His research explores the political economy and political philosophy of indigenous vernacular developmentalism in highland Ecuador. His dissertation addresses these issues through long-term ethnographic engagement with a community-based tourism organization and the quickly expanding sector of indigenous savings and credit cooperatives. James T. Spartz is an Assistant Professor of Environmental Communication at Unity College in Maine, USA. His academic interests include exploring the role of place in environmental communication, new (and old) media effects on public opinion and sustainability issues, perceptions of land use change, and discourses of transition in the Anthropocene. Spartz holds a PhD from the University of Wisconsin’s Department of Life Sciences Communication. His work has been published in Biomass and Bioenergy, Environmental Communication, Hawk and Handsaw: Journal of Creative Sustainability, Journal of Environmental Psychology, and Resilience: A Journal of the Environmental Humanities. Sumak kawsay, una visión de la buena vida que origina en el pensamiento de los intelectuales indígenas, ha sido el objeto de muchos comentarios desde su inclusión en la constitución ecuatoriana de 2008. Sin embargo no queda claro en gran parte de la literatura secundaria cómo el discurso de sumak kawsay y su derivado español buen vivir se relacionan con las experiencias cotidianas de los pueblos indígenas. Acercamos a esta falta de claridad a través de una exploración en tres partes de las perspectivas Kichwas sobre la buena vida. En primer lugar, describimos cómo es más común en las discusiones cotidianas hablar de las dificultades de la vida actual. Luego analizamos un género artístico que ilustra cómo las vidas indígenas descolonizadas podrían verse. Finalmente, examinamos cómo la filosofía política decolonial de sumak kawsay ha surgido de esfuerzos colectivos para superar la mala vida. Consideramos cómo estas tres instancias de discurso se refieren a una larga historia andina de buscar en el pasado una alternativa a las dificultades del presente y concluimos con una llamada a tomar más en cuenta las perspectivas indígenas. Invoking the good life may be a cultural universal. “Everyone wants the good life,” writes Yi-Fu Tuan (1986, 3). From ancient Greece and the Stoics of Rome to the influential essays of Montaigne in the sixteenth century (see Bakewell 2010) and contemporary critical thinkers across the globe, “the good life” represents the efforts of individuals and communities to flourish. It is “an ongoing aspiration for something better that gives meaning to life’s pursuits” (Fischer 2014, 2). But what it means to flourish is contextual, not universal. As Tuan observes, how the good life is conceived “varies greatly from culture to culture” (1986, 3). Specific interpretations of good living arise out of everyday lived experience in the context of shared cultural values, historical contexts, and environmental situations (Eduardo Gudynas, quoted in Balch 2013). Since the turn of the millennium, as a consequence of international exchanges among indigenous and nonindigenous activists (Altmann 2013, 2014), a suite of new articulations of the good life have coalesced in the decolonial scholarship of Latin American indigenous intellectuals. Advocates of these concepts argue that the vitality of ancestral culture is a condition of possibility for living well in indigenous society. They see the imposition of nonindigenous ideology, social organization, and economic practices as an attack on this condition of possibility, and the history of indigenous resistance to colonialism and its legacies as a defense of indigenous society. Advocates call for national societies to be refounded on ancestral indigenous principles and practices in order to revitalize indigenous communities. These principles and practices are also offered to the global community as an alternative to capitalism, particularly neoliberalism. The most well-known and influential decolonial articulations of the good life have emerged in Ecuadorian Kichwa as sumak kawsay and in Bolivian Aymara as suma qamaña. Another set of interpretations—known in Spanish as buen vivir or vivir bien—gained prominence in public discourse as a consequence of debates revolving around the drafting of Ecuador’s 2008 constitution and Bolivia’s 2009 constitution. Widely regarded as “the hitherto most radical constitutions of the world” (Lalander 2014, 150), these national charters identify indigenous conceptualizations of good living as foundational principles upon which to construct plurinational states. In mainstream political and bureaucratic invocations of these principles, buen vivir and vivir bien are regarded as equivalent to the indigenous concepts upon which they are based. Norman and Dorothea Whitten write, “When these Spanish and Quichua tropes are placed next to each other in the texts, they are intended to be synonymous” (2015, 192–193). The introduction to Ecuador’s 2013–2017 National Development Plan is clear on this point: “Ecuador, as an Andean country, constructs human, economic, social, cultural, and environmental rights upon a concept and worldview born in the ancient societies of the South American Andes region: Buen Vivir is Sumak Kawsay” (Senplades 2013, 16)1. However, as Whitten and Whitten (2015) indicate, the Kichwa and Spanish terms that are equated in such documents do not reflect the same understanding of what good living entails. Drawing on their work in Amazonian Kichwa communities, they explain, “The Canelos Quichua concepts of community, conviviality, kinship, integration with nature and supernature, and a shunning of capitalist wealth accumulation are all subsumed under the rubric of sumaj causai.” “By contrast,” they continue, “the basic meanings of buen vivir (living well), used literally as the ‘good life,’ are based on capitalist wealth accumulation, albeit for a common good” (2015, 193). Thus, Julien Vanhulst and Adrian Beling suggest, the concept of buen vivir is better understood as “an extrapolation” of indigenous concepts and its invocation in mainstream politics is often “necessarily reductive and cannot account for the semantic richness of the original concept” (2014, 56). Fernando Santos-Granero writes that the proponents of buen vivir “are vague as to its content, and—adopting what can only be characterized as an indigenous neocolonialist stance—they assume that what is true for the Quichua and Aymara indigenous majorities must be valid for all other indigenous peoples” (2015, 6). Andreu Viola Recasens similarly critiques what he calls the “banalization” of buen vivir in the sympathetic literature, which has tended to take an approach “more akin to a declaration of principles than a viable political and economic program” (2014, 64). A common shortcoming in this scholarship, Viola says, is “the lack of contextualization and empirical information on current living conditions of rural indigenous communities” (Viola Recasens 2014, 64). Viola argues that since sumak kawsay has emerged only recently as a coherent discourse, “and it is extremely difficult to find references to this concept in the copious ethnographic literature on Andean communities of Peru, Bolivia or Ecuador,” we should ask ourselves “whether this concept has always ‘been there’, that is, whether its origin is as ancestral as is often assumed” (Viola Recasens 2011, 272). He suggests that perhaps sumak kawsay and its cognates are best understood as invented traditions—ideas based on something that existed less centrally and less prominently within indigenous communities in the past—that have only recently been promoted by “some intellectuals, in order to divulge an idealized version of the worldview and values of Andean cultures and convert it into an alternative to the developmentalist vision (individualist, economistic, ethnocidal, and aggressive toward the environment)” (Viola Recasens 2014, 63–64). On these grounds, José Sánchez Parga (2011) characterizes sumak kawsay as a substanceless opposition to governmental policies and programs, a reactionary utopianism looking to an idealized past for a model of the future that remains blind to contemporary realities and is thus impotent to affect real change. Antonio Luis Hidalgo-Capitán, Alexander Arias, and Javier Ávila (2014, 33) counter these assertions by claiming that just because ethnographers have not documented the phrase sumak kawsay until recently doesn’t mean it hasn’t existed as social practice. “It is no less true,” they argue, “that sumak kawsay continues to be a social practice that governs the daily life of many communities, especially those that are most isolated” (2014, 34). Where others have seen Viola’s application of the label “invented tradition” as an attack on the authenticity of sumak kawsay as an indigenous concept, we take it as an invitation to respond to his more central critique: that it often remains unclear how the invocations of good living articulated by indigenous intellectuals relate to the day-to-day lived reality of indigenous communities. We cannot respond in full to Viola’s concerns in a single article, and we are humbled by the great effort that indigenous scholars have invested in communicating their positions in their own words. We do, however, offer several windows onto how indigenous people in Ecuador have engaged with and communicated culturally rooted notions of the good life in theory and practice. We begin with a discussion of a critical discourse concerned with efforts to overcome the actually existing life of struggle. This discourse is rooted in the generations-long struggle by indigenous people in Ecuador to establish fulfilling livelihoods for themselves and their communities. We then explore how Kichwa artists from the central highlands have developed a tourist-oriented genre of painting that both exemplifies such efforts to overcome the life of struggle and illustrates the revival of indigenous society that the emergent discourse of sumak kawsay envisions. Finally, we discuss indigenous intellectuals’ efforts to elaborate an indigenous political philosophy that draws upon ancestral cultural practices and principles of social organization in order to imagine a revitalized indigenous future. Ultimately, we situate sumak kawsay as a discursive thread within a broad-based decolonial project that decenters technoscientific modernization as the central premise of development by establishing indigenous worldviews and historical experiences as the grounds upon which the good life may flourish (George 2013). The Kichwa people with whom the first author of this paper (Joe Quick) has conducted ethnographic and oral history research in highland Ecuador rarely talk about sumak kawsay. The phrase makes sense to them, but the intellectual work of consciously elaborating a named set of ancestral principles and practices is not part of the everyday lives of most Kichwa people. Day-to-day discussions are far more likely to revolve around the conspicuous absence of opportunities to live well. Rudi Colloredo-Mansfeld’s informants from Imbabura Province call this state of affairs yanka kawsay, the fruitlessly exhausted life, in which “years of indigenous toil translate into nothing more than tired bodies and a handful of worn possessions” (Colloredo-Mansfeld 1998, 198). In Quick’s research in Cotopaxi Province, one man called it the miserable life, llaki kawsay. Discussions of yanka/llaki kawsay often revolve around commentaries on culture loss. Kichwa people bemoan the abandonment by youth of their native language and clothing when they leave their natal communities in pursuit of education and wage labor opportunities. Elders and youths alike talk about how much healthier ancestral foods are than the highly processed, chemical-laden foods that for economic reasons are now staples of many indigenous peoples’ diets. They express frustration with the decline in labor reciprocity within their communities, attributing the decline to labor migration and the increased need for cash within rural economies. The proximate cause of change is usually identified as increased contact with nonindigenous society. Thus, the actually existing yanka kawsay may be understood as the antithesis of the indigenous social world that is imagined by the decolonial discourse of sumak kawsay. Or, if one regards sumak kawsay as a logic statement, then yanka kawsay is its contrapositive. That is, if sumak kawsay proposes that indigenous people can achieve well-being, security, and opportunity by living according to ancestral principles, then the discourse of yanka kawsay asserts that by not living according to ancestral principles, indigenous people cannot achieve well-being, security, or opportunity. Notably, Jason Pribilsky (2016) draws a somewhat different distinction between sumak kawsay and yanka kawsay. For his informants from Cañar Province, sumak kawsay is a social state of being enmeshed in a network of productive reciprocal exchange within the community, while yanka kawsay is a life stage during which elderly people progressively withdraw from such exchanges because of physical or mental inability to reciprocate (Pribilsky 2016, 74). To the Cañaris, it is a normal and expected part of life to transition from sumak kawsay to yanka kawsay. While this usage differs from the discourse that we have discussed thus far, the relationship between the concepts is essentially the same: sumak kawsay is a matter of productive participation in a social world whereas yanka kawsay is a matter of withdrawal from that social world. The difference is that in the discourse we analyze here (in which Cañari Kichwas also participate, it should be noted), separation from the social world defined by ancestral practice is by no means considered a natural state of being; rather, indigenous people have been compelled by socioeconomic conditions to abandon their culture and communities. The distinction between indigenous discourses of sumak kawsay and nonindigenous discourses of buen vivir that is explored by Whitten and Whitten (2015) also supports this understanding. In an effort to clarify the distinction, they draw on a story that invites listeners to consider the differences between the sacha runa (person of the forest) and the alli runa (good [Christian/civilized] person). Whitten and Whitten explain that the sacha runa participates in the indigenous social world while the alli runa is estranged from that world: “The latter faces and becomes part of the nationalizing modern world, bound up in the union of church and state, to which the Runa must adapt if they are to survive” (2015, 201–202). Thus, Whitten and Whitten propose: “sumaj causai is to sacha runa as buen vivir is to alli runa. Put another way, sacha runa is to alli runa as sumaj causai is to buen vivir” (2015, 202). Once again, good indigenous lives are understood to be those that are carried out within the social spaces of indigenous culture while degraded indigenous lives are those that have been reshaped by nonindigenous society. Importantly, Whitten and Whitten also remind readers that indigenous people often find it necessary in the course of their day-to-day lives to move back and forth between the subject positions of the sacha runa and the alli runa. The structural conditions that produce yanka kawsay are a consequence of political-economic shifts in Ecuador that followed the mid-twentieth-century agrarian reforms. For historical reasons, the Amazon and Andean regions were impacted very differently by these reforms, but indigenous societies in both regions were profoundly transformed. In the broadest terms, indigenous Amazonians’ territorial integrity was impaired while indigenous Andeans’ agricultural livelihoods were undermined. As we discuss below, this difference is reflected in how indigenous people from the two regions articulate the politics of sumak kawsay. Indeed, the difference is evident in how indigenous politics has been articulated in the two regions more generally (Becker 2011). In both regions, indigenous people have found their interests unserved by the mainstream institutions of politics, governance, and economics. Many communities have opted to form their own institutions. Depending on local histories and opportunities, these institutions have taken diverse forms. Some are conceived as explicitly political entities while others act as state-sponsored local governments. Still others are formed in order to represent the common interests of particular trade groups or act as professional organizations. To be effective, such institutions need to make themselves legible to the state, but they often find it necessary to bypass the state and engage directly with nongovernmental and multinational organizations. In many ways, these institutions serve as the means and mediators of indigenous citizenship (cf. Lazar 2008) as they elaborate “the apparatus of local government without much money or guidance from the state [by making] the most of list making, council formation, boundary drawing, and inter-regional contacts” (Colloredo-Mansfeld 2009, 6). The artisan and tourism organizations created by Kichwa artists from the communities of Tigua and Quilotoa in Cotopaxi Province are among the grassroots institutions that have sought to overcome yanka kawsay. Colloredo-Mansfeld (2003, 2009) documents how the organizations formed by Tigua painters defend their members’ common interests as salespeople in Quito, how the organizations have reinvested in Tigua, and how such reinvestment has fostered the emergence of new possibilities for indigenous livelihoods. Colloredo-Mansfeld and colleagues (2018) have also explored the territorial authority that the tourism-focused organization in Quilotoa exerts over the site and resources that it administers. The tourist-oriented genre of folkloric painting around which these organizations originally formed may be traced back to Julio Toaquiza of Tigua, who is generally credited with inventing the style in the 1970s by spearheading the adaptation of traditional materials and styles of folk art (Ribadeneira de Casares 1990; Bonaldi 2010; Colvin 2004; Colloredo-Mansfeld 2009). Toaquiza was in the first generation of Kichwa youth to come of age after the agrarian reforms, find their livelihood options limited at home, and decide to leave their communities in search of wage-paying labor. But like many others, Toaquiza discovered that his options away from home were not very good either; he earned money as an unskilled laborer but he earned little, lacked job security, and was at constant risk of injury. In short, his was a llaki kawsay, a miserable life. Toaquiza found his calling as a painter after a shaman prophesied: “Before, you suffered. You will now have your own work. You will not go around suffering like you have” (Colloredo-Mansfeld 2009, 38). Julio Toaquiza never got rich from his painting, but it did make his life better. As Colloredo-Mansfeld writes, this innovative source of income “could hold Julio and his wife’s precarious household together, when combined with cultivating crops and raising livestock” (2009, 40). More importantly, “By teaching his family and some of his neighbors, Julio turned the earning potential of his craft into a new economic reserve for the community” (Colloredo-Mansfeld 2009, 41). As Francisco Ugsha Ilaquichi wrote in his picture book about life in Kichwa society: “We indigenous people of Huanu-Turupata [a community in Tigua] in the Province of Cotopaxi, not wanting to leave for Quito in search of work, have thought to paint pictures” (1985, 50–51). If, from an economic perspective, the emergence of the Tigua and Quilotoa painting genre has constituted an effort to overcome yanka kawsay, from a visual arts perspective the genre might be understood as an effort to portray sumak kawsay. The painting genre predates the political discourse of sumak kawsay by several decades, so it would be improper to equate them directly, but they parallel one another inasmuch as both envision a socionatural world predicated on Andean conceptions of good living. The artists of Tigua and Quilotoa are subject to the “tourist gaze” (Urry 2002) and have learned to anticipate what international tourists expect of indigenous culture. As Blanca Muratorio writes, “the indigenous people of the highlands have mastered the subtleties of the competitive scene and know exactly who should wear ‘typical clothes’ and take ‘appropriate body attitudes’ if they want to legitimize, authenticate, and increase their sales” (2000, 56). Painters have also learned to avoid overtly political themes and to minimize the presence of overtly nonindigenous or nontraditional material culture in the scenes they illustrate (Colloredo-Mansfeld 2011, 19). Yet artists do not simply paint what the tourists want to see. To the contrary, Dorothea Whitten argues that they “paint the nation as they see and experience it” (2003, 247, emphasis added). Painters eliminate nonindigenous and nontraditional elements from their portrayals of Kichwa culture and society but, as Colloredo-Mansfeld learned in Tigua, they do so “because, even if [nonindigenous elements] fit into their personal experience, they do not allow those experiences to connect up to a wider indigenous life course” (Colloredo-Mansfeld 2011, 20). That is, the nonindigenous cultural goods and practices that the discourse of yanka kawsay identifies as threats are eliminated from the artists’ portrayals of Kichwa society in favor of a vision of indigenous society that perpetuates ancestral culture. Alessandro Portelli writes that, for the scholar, “the importance of oral testimony may not lie in its adherence to fact, but rather in its departure from it, as imagination, symbolism, and desire emerge” (1991, 51). We find the same to be true of Kichwa painting. As Whitten indicates, the painters of Tigua and Quilotoa “reflect a clear sense of alternative modernities” (2011, 146). Touristic sales aside, the value of the genre—like the value that Portelli attributes to oral history—lies not in its adherence to objectivity but in the artists’ “effort to make sense of the past and to give a form to their lives” (Portelli 1991, 52). The painters endeavor to do so by symbolically decolonizing indigenous social worlds. The decolonial orientation of the genre is most evident in the work of a handful of painters who have explored topics beyond those that sell best in tourist markets. Such works have been catalogued by Jean Colvin (2004) and Francesca Bonaldi (2010), Alfredo Toaquiza has assembled an impressive collection in his gallery in Tigua, and examples may be found in museums throughout Ecuador. A 2002 painting by Fausto Toaquiza provides a clear example of how such alternative visions counter the historical exclusion of indigenous people in Ecuadorian society by placing indigenous people and cultures at the center of historical events and subordinating powerful symbols of the nation to indigenous power. Displayed in the foyer of a private museum in Cuenca, the painting depicts the ouster of President Jamil Mahuad in 2000. At the center of the action is the so-called “government of national salvation,” consisting of Lucio Gutierrez, Antonio Vargas, and Carlos Solórzano. Gutierréz, the nonindigenous army colonel who would later be elected president, appears to be in charge because he is holding the microphone, but the Amazonian and Tsachila shamans in the crowd below and the pre-colonial indigenous leader who appears in the clouds above are all directing their power toward Vargas, the president of Confederación de Nacionalidades Indígenas del Ecuador (CONAIE). Throngs of indigenous people from all over the country march proudly into the action carrying banners featuring indigenous political slogans while the president and his cronies make a hasty escape with a suitcase marked with a dollar sign. Perhaps most significantly, the presidential palace, the national bank, and the iconic statue that stands over Quito have all been transported to the countryside near Tigua. The painting depicts a vision of Ecuadorian society in which the institutions and individuals at the center of mainstream Ecuadorian society are subordinated to indigenous authority. In short, this is a scene of indigenous political empowerment, not a mere political protest. A painting by Juan César Umajinga of Quilotoa (Figure 1) illustrates how the decolonial vision that so powerfully animates Fausto Toaquiza’s painting may also be found in less striking examples of the genre. The painting shows indigenous people tending animals, sorting potatoes, weaving a poncho, playing a panpipe, and conducting a healing ritual. Condors and owls appear in the sky. A personified rock face in the background illustrates the persistence of Andean cosmology in the presence of a Catholic church. In other words, the painting is at first glance an unremarkable example of “slice of life” paintings that typify the tourist-oriented face of the genre (Whitten 2003, 2011). However, when the artist first showed Quick another version of this scene, he said that it shows buen vivir. Painting depicting buen vivir as the renewal of Kichwa society, by Juan César Umajinga of Quilotoa, from the personal collection of Joe Quick. When asked how the painting shows buen vivir, Juan César pointed out the traditional activities in which the people in the painting are engaged. He left it to the ethnographer to reflect that many of the elements that he had pointed out are the kind of disappearing ancestral practices lamented in the discourse of yanka kawsay. Yet close attention to the scene reveals that the painting does not show an ancestral community. For instance, the buildings are made of cinder blocks; the most striking sign that this is a future-oriented community is that a woman in the lower left corner is reading a book in Kichwa. Whether by coincidence or by design, the book’s title is Ñuka kawsay, which means “my life.” Perhaps the artist was thinking of Ugsha Ilaquichi’s 1985 bilingual Spanish-Kichwa picture book Como vivimos (How we live) in which the author identifies painting as a way to reinvigorate rural indigenous livelihoods. Further investigation revealed that Umajinga’s painting is a reproduction of a painting by Alfonso Toaquiza of Tigua that appeared on the cover of a manual about capacity building in economic development produced by the Rural Development Project in Cotopaxi Province (Proyecto de Desarrollo Rural en la Provincia de Cotopaxi, PRODECO). Umajinga decided to copy Toaquiza’s painting simply as an exercise in maintaining his skills as a painter during a period in which he needed to devote most of his time and energy to his responsibilities as an elected official in the parish government of Zumbahua. 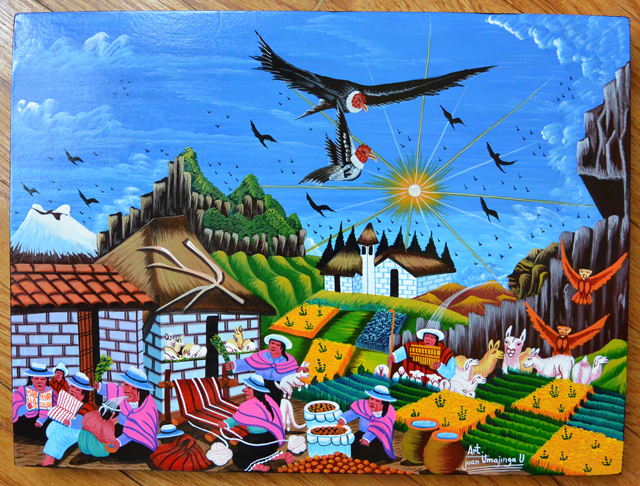 Yet the appearance of the original painting on the cover of a PRODECO publication is nonetheless significant: the scene was first envisioned as a visual summary of the projects that PRODECO had completed in its efforts to revitalize the rural economy in Cotopaxi. Thus, the scene that Umajinga identified as a depiction of buen vivir illustrates a socioeconomic renewal of Kichwa society that is actively becoming. Toaquiza gave credit to the institutions that had made PRODECO’s efforts possible by including the logos of the European Union and the Development Council of the Nationalities and Peoples of Ecuador (Consejo de Desarrollo de las Nacionalidades y Pueblos del Ecuador, CODENPE). Indigenous intellectuals have typically engaged with sumak kawsay as a philosophical project of explicating the moral principles and modes of social relations on which to build a better society. Their efforts are informed by experience in the local-level institutions that work to overcome yanka kawsay. Indeed, many of them began their careers as leaders in such organizations and then moved on to local political positions such as that held by Juan César Umajinga before they achieved national prominence as politicians or widespread notoriety as intellectuals. However, the intellectual discussion of sumak kawsay tends to engage with indigenous culture more consciously and more abstractly than is usually required in the everyday politics of local government. The Amazonian Kichwa community of Sarayaku issued a long-form press release in 2003 that may be read as a segue from grounded critique of the actually existing yanka kawsay to exegesis of the aspirational sumak kawsay (Sarayaku 2003). Written in a collective voice, the document addresses the community’s strong opposition to the expansion of oil extraction within its ancestral territory and frames Kichwa economic practices and ecological understandings as profoundly anticapitalist and anticolonial. It describes sumak kawsay as both “fullness of life” and “life in harmony” while identifying the concept as an ancestral model upon which to challenge the social and environmental destructiveness of neoliberal capitalism as well as a platform for building a better future. Kawsak Sacha (The Living Forest) is a proposal for living together with the natural world that grows out of the millennial knowledge of the Indigenous Peoples who inhabit the Amazonian rainforest, and it is one that is also buttressed by recent scientific studies. Whereas the western world treats nature as an undemanding source of raw materials destined exclusively for human use, Kawsak Sacha recognizes that the forest is made up entirely of living selves and the communicative relations they have with each other. These selves, from the smallest plants to the supreme beings who protect the forest, are persons (runa) who inhabit the waterfalls, lagoons, swamps, mountains, and rivers, and who, in turn, compose the Living Forest as a whole. These persons live together in community (llakta) and carry out their lives in a manner that is similar to human beings. Reflecting broader indigenous political patterns in Ecuador, indigenous intellectuals from the Andean region usually frame their discussion of sumak kawsay in political-economic terms rather than the political-ecological terms favored by the leaders of Sarayaku and other indigenous intellectuals from the Amazon. However, Andean and Amazonian thinkers alike mobilize the concept in order to mount a defense of community, culture, and territory. They agree that ancestral principles and practices are the grounds upon which to contest structural and material violence in the present and to build a better future. Sumak is plenitude, sublime, excellent, magnificent, beautiful, superior. Kawsay is life; it is becoming [ser estando]. But it is dynamic, changing; it is not a passive affair. Macas writes, “The communal system is sustained in the principles of randi-randi: the conception and practice of life in reciprocity, redistribution, principles that are managed and are in force in our communities. It is based in the collective vision of the means of production; there is no individual ownership, property is communal” (2010a, 14). He goes on to identify and explain specific types of reciprocity practiced in Andean Kichwa communities and then makes a strong claim that the good life based on the practice of such reciprocity is incompatible with the organization of Western society. For Macas, the discursive purpose of sumak kawsay is to reclaim the narrative, “to recuperate and develop our systems of life, historical institutions and rights, predating the State, in order to decolonize history and thought” (2010a, 16). He proposes it “as an option of life for all,” not simply an indigenous idea for indigenous peoples but “for the entire society” (2010a, 16). Indeed, Macas takes the view that the formulation of “proposals from a cultural and political position” has been the most important work of the indigenous movement and that such proposals have the potential to transform “society, the State, and the system in general” (2010b, 14). The economy should be based on ancestral principles such as the “sumak kawsay” as posited by the buen vivir, in the principle of reciprocity fostered by the communities in practices like the minga, the randy randy, the cambia mano or maki mañachi. Principles that radically question economic accumulation as the object of the economy. The proposed economy should foster the harmonic coexistence of persons and peoples among themselves and with nature. Biodiversity and nature are not another commodity that is bought and sold and that is exploited irrationally, nature is the pachamama, we’re part of the same, therefore relationships with the natural environment should be respectful. Thus, discourses of sumak kawsay may be viewed as grounded in a constellation of overlapping, interconnected, and dynamic social, economic, and ecological principles. They include: (1) the understanding that the social world involves human as well as nonhuman life, (2) the obligation to engage in reciprocity with others in the social world, (3) the proscription of greediness in the practice of such relationships, and (4) the maintenance of harmony or balance within the social world as a whole. The practice of these principles is taken as inherently political and inherently antithetical to the capitalist ethos rooted in extractivism and oriented toward material accumulation. All of these principles are documented in the ethnographic literature and have long circulated in the discourse of Ecuador’s indigenous movement, but only as a result of the political-philosophical elaboration of sumak kawsay have they coalesced into a named model of good living. Andean utopia is not only an effort to understand the past or to offer an alternative to the present. It is also an attempt to glimpse the future. It has these three dimensions. Within this discourse, it matters as much what has happened as what is going to happen. It announces that someday the time of the mistis will come to an end and a new age will begin. —Alberto Flores Galindo (1988, 78). The discourse of sumak kawsay must be understood in the context of a centuries-long Andean tradition of looking to the past for an alternative to the llaki kawsay of the present. While the Spanish colony was young and memories of the injustices of Inca rule lingered, followers of the Taqui Onqoy movement looked to an even earlier era; they “predicted the resurrection of the huacas, that is, local deities” (Flores Galindo 1988, 50). Later, the Incas came to be remembered as a “counterpoint to the dramatic injustice and imbalances of the present day” (Flores Galindo 1988, 27). Elements of these former memories linger on in modern indigenous Andean thought: Inca warriors and huacas both appear in Tigua and Quilotoa paintings as sources of authority and legitimacy for Ecuador’s modern indigenous leaders. In other words, the Tigua-Quilotoa genre of painting and the political discourse of sumak kawsay are manifestations of deep Andean decolonial historiography. There are two different ways that we might make sense of this decoloniality. We might draw on Joanne Rappaport’s work with Nasa intellectuals in Colombia, who give voice to “history as it should have occurred” (1998, 205, emphasis in original). As Muratorio writes, “Tigua paintings are visual ethnographies and histories from which subordinate groups begin to tell their own alternative histories as one of many strategies to assert their identity” (2000, 57). In communicating these alternative histories, “Tigua artists make selective use of the memory of their oral tradition to give new meaning to their daily practices in modern life” and, as such, demonstrate “their ability to resignify and reformulate the symbols and discourses of the hegemonic culture in order to make them their own” (Muratorio 2000, 57–58). From this perspective, the genre flips the script on colonial and postcolonial histories of dispossession and subordination by recentering marginalized indigenous practices and principles. Or we might draw on Mark Rifkin’s exploration of “native conceptualizations, articulations, and impressions of time that do not easily fit within the framework explicitly or implicitly oriented around settler needs, claims, and norms” (2017, 4). As Rifkin indicates, colonial understandings of history and society tend to efface indigenous modes of being in the world. Thus, to gain the recognition of nonindigenous society, “indigenous histories, modes of collectivity, and relations to place” must usually be translated into dominant frames (Rifkin 2017, 6). To refuse such translation is inherently political, and to symbolically subordinate nonindigenous frames in indigenous depictions of society and history is to critique dominant frames at the deepest levels. This is precisely what the Kichwa artists of Tigua and Quilotoa do in their paintings (Colloredo-Mansfeld 2011, 20). The latter interpretation of artists’ efforts to decolonize history most closely reflects the evolving political-philosophical discourse of sumak kawsay and its engagement of the world through ancestral principles and practices. Indigenous intellectuals are not antimodern but they recognize that modernism has often been anti-indigenous (Viola Recasens 2011, 2014). They know that their understanding of humans’ relationship to the natural world is at odds with dominant Western cultural conceptions of the environment (Hansen and Machin 2013, 161). Recognizing that contemporary Western society disavows a worldview that refuses to separate culture and nature, in which human and nonhuman beings are co-participants in the social world (de la Cadena 2015), indigenous intellectuals understand that “the authority of subaltern perspectives remains subject to the epistemic violence associated with colonialism” (Radcliffe 2012, 247). They have accumulated centuries of frustrated experience attempting to articulate these principles and practices in terms that nonindigenous people can understand (Sarayaku 2003). The discourse of sumak kawsay seeks a hegemonic inversion that subverts dominant development narratives by proposing that fulfilling lives may only be achieved by reaffirming and enacting indigenous ancestral principles. As such, sumak kawsay acts as a discursive alternative to status quo “development” scripts (i.e., Western, neoliberal, technoscientific) by suggesting one of a number of “alternatives to development” that Arturo Escobar (2012) distinguishes from otherwise status quo “development alternatives.” By enacting an affirmative ancestral worldview responsive to a pluralistic, multimodal, and highly mediated twenty-first century, this approach also aligns with George’s “postscientific understanding of development as good life” (2013, 594). It rejects or subverts the hegemony of scientific reductionism or technoscientific modernization in favor of seeing development work not as simply economic development but as human development, rooted in the history of particular human lives in particular cultural contexts and locales. The discourses of sumak kawsay affirm an aspiration to organize Ecuadorian society, politics, economy, and territory according to indigenous principles. It is a project of political philosophy elaborated in ideological terms by intellectuals and politicians and pursued both individually and collectively as an element of indigenous human-centered development. These discourses are highly critical of the capitalist practices and principles that have led to the actually existing yanka kawsay, which makes them attractive to the nonindigenous environmentalists and leftists who have “extrapolated” the concepts of buen vivir and vivir bien. But not all anticapitalist discourses are equivalent, nor should they be treated as such. Ontological differences must be acknowledged and taken into account if a concept such as sumak kawsay is to be anything more than a slogan when it is deployed outside indigenous intellectual circles. Pragmatic indigenous politicians and painters know very well that they must communicate in terms that nonindigenous people are prepared to understand. Yet, as Juan Ricardo Aparicio and Mario Blaser indicate, “in most cases we ‘modern intellectuals’ stop short of truly engaging with these knowledges on their own terms, and thus remain entrenched in our position of authority, reproducing the current configuration of power/knowledge” (2008, 84). Nonindigenous listeners must make a greater effort to understand indigenous concepts in indigenous terms rather than attributing their own cultural perspectives to indigenous people. This does not mean that nonindigenous scholars and politicians must jettison their own worldviews. As Whitten and Whitten (2015) remind us through their deep engagement with their Napo Runa interlocutors, it is not necessary to choose between indigenous and nonindigenous perspectives. Indeed, much of what is most stimulating and most generative about concepts like sumak kawsay is that they compel us to acknowledge the plurality of ideas about good living and well-being. Let us therefore endeavor to embrace indigenous perspectives as such and not attempt to subordinate them, assimilate them, or equate them to dominant nonindigenous narratives. 1All translations by Joe Quick. Joe Quick’s research in Ecuador was supported by a Tinker-Nave Summer Field Research Grant awarded by the Latin American, Caribbean and Iberian Studies Program at the University of Wisconsin-Madison, and by a Fulbright-Hays Doctoral Dissertation Research Abroad Fellowship (#P022A130013-004). James T. Spartz was partially supported by Unity College Faculty Grants for Scholarship (2016–2017) during his work on this project. Bakewell, Sarah. 2010. How to Live, or, A Life of Montaigne in One Question and Twenty Attempts at an Answer. New York: Other Press. Balch, Oliver. 2013. “Buen vivir: The Social Philosophy Inspiring Movements in South America.” The Guardian, February 4. http://www.theguardian.com/sustainable-business/blog/buen-vivir-philosophy-south-america-eduardo-gudynas. Becker, Marc. 2011. Pachakutik: Indigenous Movements and Electoral Politics in Ecuador. Lanham, MD: Rowman and Littlefield. Benítez Trinidad, Carlos. 2014. “Sumak Kawsay, Sumak Allpa y Sacha Runa Yachay: Entrevista a César Cerda Vargas.” Iberoamérica Social, February 14. http://iberoamericasocial.com/sumak-kawsay-sumak-allpa-y-sacha-runa-yachay/. Bonaldi, Francesca. 2010. Entre dos culturas: Los pintores andinos de Tigua. Quito: Abya-Yala. Colvin, Jean. 2004. Arte de Tigua: A Reflection of Indigenous Culture in Ecuador / Una reflexión de la cultura indígena en Ecuador. Quito: Abya-Yala. CONAIE (Confederación de las Nacionalidades y Pueblos Indígenas del Ecuador). 2007. Propuesta de la CONAIE frente a la Asamblea Constituyente: Principios y lineamientos para la nueva constitución del Ecuador. Quito: CONAIE. Escobar, Arturo. 2012. Encountering Development: The Making and Unmaking of the Third World. Princeton, NJ: Princeton University Press. Fischer, Edward. 2014. The Good Life: Aspiration, Dignity, and the Anthropology of Wellbeing. Stanford: Stanford University Press. Flores Galindo, Alberto. 1988. Buscando un Inca: Identidad y utopia en los Andes. Lima: Editorial Horizonte. Graham, Laura R. 2002. “How Should an Indian Speak? Amazonian Indians and the Symbolic Politics of Language in the Global Public Sphere.” In Indigenous Movements, Self-Representation, and the State in Latin America, edited by Kay B. Warren and Jean E. Jackson, 181–228. Austin: University of Texas Press. Hidalgo-Capitán, Antonio Luis, Alexander Arias, and Javier Ávila. 2014. “El pensamiento indigenista ecuatoriano sobre el Sumak Kawsay.” In Sumak Kawsay Yuyay: Antología del pensamiento indigenista ecuatoriano sobre Sumak Kawsay, edited by Antonio Luis Hidalgo-Capitán, Alejandro Guillén García, and Nancy Deleg Guazha, 29–73. Huelva and Cuenca: FIUCUHU. Lazar, Sian. 2008. El Alto, Rebel City: Self and Citizenship in Andean Bolivia. Durham, NC: Duke University Press. Macas, Luis. 2010a. “Sumak Kawsay: La vida en plenitud.” America Latina en Movimiento 34(452): 14–16. Macas, Luis. 2010b. “El Sumak Kawsay.” Yachaykuna 13: 13–39. Muratorio, Blanca. 2000. “Etnografía e historia visual de una etnicidad emergente: El caso de las pinturas de Tigua.” In Desarrollo cultural y gestión en centros históricos, edited by Fernando Carrión, 47–74. Quito: FLACSO. Noroña S., Maria Belén. 2014. La toma de la laguna: Turismo comunitario, identidad y territorio en el Quilotoa. Quito: Abya Yala; Centro Andino de Action Popular. Portelli, Alessandro. 1991. The Death of Luigi Trastulli and Other Stories: Form and Meaning in Oral History. New York: State University of New York Press. Pribilsky, Jason. 2016. “Remaking the Yanga Kawsay: Andean Elders, Children, and Domestic Abuse in the Transmigration Logics of Highland Ecuador.” In Transnational Aging: Current Insights and Future Challenges, edited by Vincent Horn and Cornelia Schweppe, 64–84. New York: Routledge. Rappaport, Joanne. 1998. The Politics of Memory: Native Historical Interpretation in the Colombian Andes. Cambridge: Cambridge University Press. Ribadeneira de Casares, Mayra. 1990. Tigua: Arte primitivista ecuatoriano. Quito: Centro de Arte Exedra. Sánchez Parga, José. 2011. “Discursos retrovolucionarios: Sumak Kausay, derechos de la naturaleza y otros pachamamismos.” Ecuador Debate 84: 31–50. Santos-Granero, Fernando. 2015. “Introduction: Images of Public Wealth.” In Images of Public Wealth or the Anatomy of Well-Being in Indigenous Amazonia, edited by Fernando Santos-Granero, 3–34. Tucson: University of Arizona Press. Sarayaku (Pueblo Originario Kichwa de Sarayaku). 2015. “Kawsak Sacha – The Living Forest. An Indigenous Proposal for Confronting Climate Change.” Presented by the Amazonian Kichwa People of Sarayaku. https://www.slideshare.net/JosejSanti/kawsak-sacha-the-living-forest-an-indigenous-proposal-for-confronting-climate-change. Sarayaku (Territorio Autónomo de la Nación Originaria del Pueblo Kichwa de Sarayaku). 2003. “Sarayaku sumak kawsayta ñawpakma katina killka.” Press release, October 15. Senplades (Secretaría Nacional de Planificación y Desarrollo). 2013. “Plan Nacional para el Buen Vivir 2013–2017.” Quito: Senplades. Tuan, Yi-Fu. 1986. The Good Life. Madison: University of Wisconsin Press. Ugsha Ilaquichi, Francisco. 1985. Como vivimos. Quito: Abya-Yala. UNIFEM (Fondo de Desarrollo de las Naciones Unidas para la Mujer). 2011. Justicia nuestra. YouTube video, 23:54, June 1, posted by DED Archiv-Kanal, https://www.youtube.com/watch?v=xtr3tFAUXrA. Urry, John. 2002. The Tourist Gaze. London: SAGE Publications. Viola Recasens, Andreu. 2011. “Desarrollo, bienestar e identidad cultural: Del desarrollismo etnocida al sumaq kawsay en los Andes.” In Etnicidad y desarrollo en los Andes, edited by Pablo Palenzuela and Alessandra Olivi, 255–302. Sevilla: Universidad de Sevilla, Secretariado de Publicaciones. Whitten, Dorothea Scott. 2011. “Indigenous Ethnographers Portray Their World.” In Histories of the Present: People and Power in Ecuador, edited by Norman E. Whitten Jr. and Dorothea Scott Whitten, 143–161. Champaign: University of Illinois Press. Whitten, Norman E., Jr., and Dorothea Scott Whitten. 2015. “Clashing Concepts of the “Good Life”: Beauty, Knowledge, and Vision Versus National Wealth in Amazonian Ecuador.” In Images of Public Wealth or the Anatomy of Well-Being in Indigenous Amazonia, edited by Fernando Santos-Granero, 191–215. Tucson: University of Arizona Press.